SALE! Scion Leather seat cover kits $475 + FREE SHIPPING! Here we have a very nice Clazzio leather seat cover kit installed in a Scion XB. It has a red perforated leather Insert, Black leather body, and red stitching. This leather seat cover kit can be custom made to fit your Toyota or Scion. 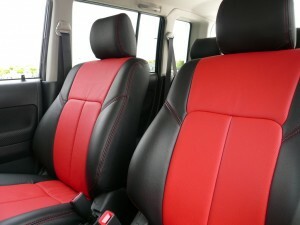 Currently, we are running a special on all Scion leather seat cover kits. Leather kits are $475 and suede kits are $399. We are also currently offering Free UPS Ground shipping on all orders. Posted on February 19, 2009 Categories News / UpdatesTags car leather, car seat cover, clazzio, clazzio leather, clazzio leather kit, clazzio leather seat cover, clazzio seat, leather kit, leather seat cover, leather seat cover kit, leather seat kit, legendary leather, scion leather seat cover, scion xb leather kit, scion xb leather seat cover kit, seat cover, toyota leather seat cover, xb leather kitLeave a comment on SALE! Scion Leather seat cover kits $475 + FREE SHIPPING!